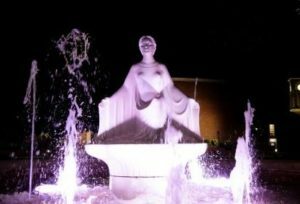 The Beta Psi Chapter of Alpha Chi Omega will Light the Lady as an awareness-raising event for domestic violence at 7 p.m. Oct. 24 at the Lady of the Mist in the Louisiana Tech University Quad. Light the Lady is an annual candlelight vigil hosted by Alpha Chi Omega, Beta Psi, to raise funds for DART (Domestic Abuse Resistance Team), and support domestic violence awareness. This year the event will feature speakers from DART and Alpha Chi Omega, as well as the stories of both survivors and victims of domestic violence in north Louisiana. The sorority will be selling luminaries the week prior to the event for a dollar each. All who purchase a luminary or donate at the event itself will be entered in a raffle to win two free tickets to Six Flags Over Texas. There will be a total of four possible winners, each will receive two tickets a piece. Alpha Chi Omega members are working to open a dialogue about this subject and raise awareness about local organizations that assist victims of domestic violence in Louisiana. One of those organizations is DART, a non-profit organization established in 1994. DART provides services such as safety planning, case management, shelter, legal advocacy, supportive counseling, and a crisis hotline. The Beta Psi chapter of Alpha Chi Omega holds many events throughout the year to raise funds to support both DART and victims of domestic violence. Raising awareness of domestic violence is a national focus for the philanthropic efforts of Alpha Chi Omega members, and this cause has been one that local members have embraced wholeheartedly.